Please click here for PDF of the handout. The New Era of Treatments That Work, Conference on DBT, MBT, and TFP sponsored by McLean Hospital, Boston, Massachusetts. 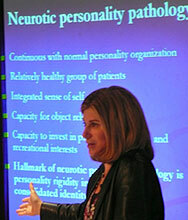 Audio lecture "Narcissism and Borderline Personality Disorder, Frank Yeomans, M.D., Ph.D." within Feb. 2009 section.